The FeesMustFall protest has in essence become a fight for free education. But as an early life lesson to all, nothing in life is free, and everything comes at a cost. And the situation is further complicated by the ‘tripartite’ approach to this mess. You’ve got government, universities, students and now a new fourth entity (the marauding thugs). How often we see the select few taint the wider group. All these entities see the picture a little differently and to find a common ground looks seemingly impossible. Once again, marauding thugs have disrupted normal activities at the University of Cape Town (and other universities in South Africa). Although they are fond of presenting themselves as victims and as a progressive vanguard, they are in fact the very opposite. They are perpetrators who violate the rights of others, and they are the agents of destruction, which, in the long run, is not good for anybody, least of all those whose interests they purport to represent. In a rights-respecting democracy, we all have a very strong duty to respect the law. The social contract we have is that disagreements about what the law should be are sorted out via the designated political and legal processes. We then have a presumptive duty to respect the law on the understanding that that is the cost of expecting that others will respect the law when they disagree with it. You must obey the laws you don’t like because otherwise you’ll have no grounds for expecting me to obey those laws I don’t like. Yet the student protesters want things both ways. They expect the University to comply with the law while they themselves trample all over it. They are the first to demand their rights, while routinely violating the rights of those whose education they disrupt, those whom they intimidate and harass (sometimes with racist invective), and in some cases, those whom they physically assault. In the face of this illegality, the University of Cape Town Executive has repeatedly taken a soft path, attempting to negotiate and appease. There are, however, some serious problems with becoming the University of Capitulation. First, the University becomes complicit in the protesters’ violation of others’ rights. We are repeatedly told that “UCT recognises the right to engage in legitimate and peaceful protest and urges protesters to respect the right of other members of the campus community to attend classes and arrive at work.” However, urging protesters to respect the rights of others is simply not sufficient. One actually has to protect those rights. Second, capitulation encourages those who seek to hold the University hostage to its growing list of demands. One reason we are facing disruptions in 2016 is that the University surrendered in 2015. Had it conveyed a firm message last year that illegal behaviour would not be tolerated, it would have removed one incentive to the present (and potential future) disruptions. Third, allowing chaos to reign on campus damages the University. In the short run, education cannot be delivered, researchers are distracted, and administrators have to spend time and energy on protest-related matters, diverting them from their actual work. In the medium and longer term such disruptions contribute to making UCT less attractive to donors and to prospective staff and students. The latter include the significant “Semester Study Abroad” contingent of students who come from overseas for a semester and bring much-needed income for the University. However, it also includes prospective students from those families who could afford to send them abroad for their studies. UCT also stands to lose staff who seek more hospitable work conditions. The protesters may dismiss these concerns and respond “good riddance”, but they, others like them, or their children will eventually suffer the consequences. Finally, the University is passing up an opportunity to teach the protesting students an important life lesson, namely about the rule of law. Instead, the University has indulged a self-righteous narrative that puts the protesters above the law. We are all entitled to protest, but if one thinks that this is a licence to do as one pleases, one needs to be disabused of that idea – the sooner the better. The University has been reluctant to enforce the law, and has instituted disciplinary proceedings against only a handful of students, despite many more students’ having engaged in illegality. This, it seems, is because it wants to avoid a “heavier, hands-on security presence”. Indeed, we can be sure that the moment force is used against illegality, the protesters will call “foul”. They will be supported by other sectors of the university, including some members of staff who have been egging on the disruptive protesters either explicitly or subtly. They will also be supported, or at least not opposed, by the campus’s “useful idiots”, who will earnestly condemn the “use of force”. What is lost on all of them is the fact that law is ultimately backed up by force. Many people comply with the law without the need for force to be used. However, the threat of force always lurks in the background and sometimes has to be exercised. For example, if one refuses to pay fines, one may be summoned to court. If one refuses to present oneself or to comply with the court’s verdict, one may be arrested. If one resists arrest, force will be used to effect the arrest. If one uses force in return, then greater force will need to be used. That is the way it has to be, for otherwise there would be no sanction attached to breaking the law. Laws without teeth are not laws. What should be done? First, the University Executive must recognize its responsibilities to the vast majority of members of the University who want to go about their work and studies. They must protect them from those who violate their rights by disrupting the functioning of the University. It must do so sooner rather than later. 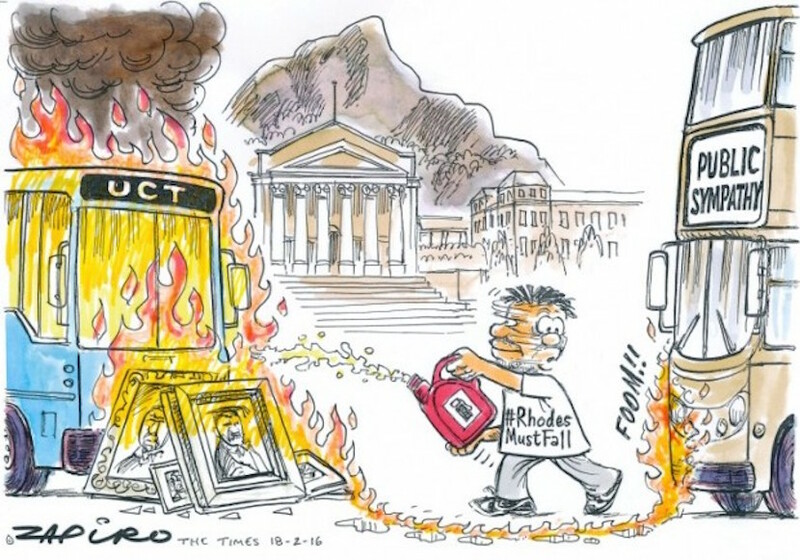 Zapiro’s take on the UCT student protests – for more of the cartoonist’s magic, click here. The SRC is typically elected by a small proportion of students, with the vast majority of potential voters not voting. The result is an SRC that, although filled with its own importance and purporting to speak on behalf of students, in fact only represents those students who take the SRC seriously enough to vote. Students who do not want their education, examinations and graduations disrupted or delayed, must take themselves to the polls and vote. A more representative SRC that opposes illegality would also provide a clearer contrast with the groups orchestrating the illegality and which are not elected student bodies. What should be done and what will be done frequently diverge. I have no expectation that they will converge in this case. However, if they do not, then UCT – and South Africa – will pay the price.